Was the Feisty & Feminine Workshop about the Muslim Faith in Lawrence a Success? CWA of Kansas would like to show much appreciation to the Douglas County Prayer/Action Chapter Leader, Michelle Lynn, for her courage in asking for a Feisty & Feminine Workshop in Lawrence, Kansas. The workshop was on something needed in the Lawrence area, Dispelling Fear and Encouraging Diplomacy when Interacting with those of the Muslim Faith. Lawrence has had a great influx of Muslims because of Kansas University Campus. The date was set for April 30. We asked Dr. Dawlat Bishara and Dr. Safwat Bishara to be on the panel. The Bisharas were both born and raised in Egypt, came to the United States and obtained citizenship over 30 years ago. As Coptic Christians, they were neighbors with Muslims and wanted to share about the friendships they built and the history of Egypt before and after Muslims came. They planned to share their experiences of living peacefully but wisely as Christians next to Muslims in Egypt. 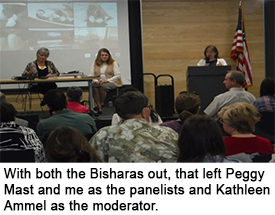 In addition, we invited Peggy Mast, former-Speaker Pro Tem, to be on the panel. She sponsored laws to protect those who were trapped in Sharia Law and wanted out. All of her bills passed. That is what America is about: freedom for everyone — especially those who come to us under such duress, as some women who live with Sharia Law. The idea behind this workshop was to approach the subject in a gentle, non-combative manner. It was open to the public, but, as you will see, perhaps it should have been closed. The day before the workshop, we got word that the Muslim group, CAIR (Council on American-Islamic Relations), was planning on disrupting the meeting. We immediately alerted the Lawrence Police Department. They told us to call the dispatch if any disruptions occurred. Wait. How did CAIR even know about the workshop? Come to find out, it was a former Planned Parenthood employee who got it from our statewide e-alert. Apparently (and understandably), Planned Parenthood keeps tabs on what CWA of Kansas does. Why would Planned Parenthood be interested in something about the Muslim faith? We will tell you why; it seems that Planned Parenthood, CAIR, and possibly even the LGBT community, have become a sort of coalition. Their numbers are small, individually, so maybe they have decided to come together and make more noise. We knew this new development might be a problem for the Bisharas. It was, and the Bisharas decided it would be best not to attend. They feared for their relatives in Egypt. It was disappointing to them, and their whole countenance showed it as I brought the news to them. It was also disappointing to our people; several reported that hearing the Bisharas was the reason they came in the first place. This just illustrates why Islam, violent Islam, must be opposed. We are not an oppressed nation. We are a kind, open, loving nation. We are a free nation. If a person wants to be on a panel to discuss anything, they have a right to do so. However, places like Egypt are not free. People left in Egypt can be in jeopardy. That is a fact about the world we live in until Christ returns and Egypt and the rest of the world are set free. As attendees entered the library, the protesters came in from the sidewalk with their signs in tow; some signed the welcome sheet right along with the legitimate attendees. The feeling in the room was palatable with hatred on the part of the protesters. The attendance was half our people and half CAIR. We began the introductions and showed a video of Penny Nance and shared the Feisty & Feminine Workshop project with the audience. To stir it up a bit, as if it hadn’t been stirred up enough, we decided to start the event by answering questions that CAIR had planned to ask. Then Peggy brought forward a discussion on the Koran, the Bible and how the Koran starts with peace and proceeds to violence while the Old Testament shows the violence in a world without God and how He continually bring us to peace within the New Testament, showing a loving peaceful way to live and how as believers we are to seek peace. We asked for questions to be written down from the audience. We stated that there was to be no verbal response from the audience. Almost immediately, we had to call the police, because one member of the audience would not obey the rule; we took his picture, and he became overbearing. The panel kept going while this was taking place, and we did our best — with most of the weight on Kathy and Peggy. Most of the questions were written with a biased view and were off of the subject matter completely. We were able to establish some order under the threat of being hauled out by the police. The questions then became about white supremacists and the KKK, and many in the audience started yelling. We ended the meeting early. I am unsure if our mission was accomplished. With all the disruptions from CAIR, it made it close to impossible to both dispel fear and give instructions on how to interact with them with respect.